• Beaches, scuba diving, swimming and snorkeling – Any of the Bay Islands. West Bay on Roatan is a picture of serene beaches, quiet days, and healing waters. You have to spend at least two evenings on one of the Bay Islands if you are going to Honduras on vacation. Do it. Utila is the least expensive and draws the backpacking crowd. Roatan is more upscale. Guanaja is for those that just want wonderful solitude with their diving or swimming. • Honduras 'yesterday' - Copan Ruinas. No one can leave Honduras while on vacation with out visiting the ruins. Even if you are only interested in diving, visit Copan Ruinas; the history and culture are too rich to miss. Fly from the Bay Islands to San Pedro Sula, visiting the Museum of Anthropology and History. 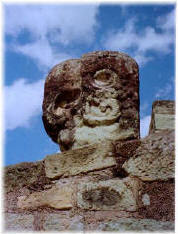 Then, use Hedman-Alas’s first-class bus to Copan Ruinas, stay the night, and take another full day there. Spend some time in the shops that dot the village while you are there to visit Copan Ruinas. • Urban experience – Tegucigalpa or San Pedro Sula. While on vacation in Honduras, visit one city or the other -- unless you plan on flying between them. If you arrive in and depart from San Pedro Sula, you are closer to the Bay Islands. Leave Roatan first thing in the morning and you can make an 11 a.m. - 1 p.m. connection back home. Voila, another night on the islands. • City life with zest, nothing beats La Ceiba. Ah, Ceiba. A rich variety of people, music (you have to try the punta - local dance), the Caribbean sea, fresh fish, markets, good shopping, a laid-back attitude with a perpetual smile – that’s Ceiba. Cuero Y Salado Wildlife Refuge is a tropical forest preserve with a particular emphasis on manatee preservation. It is a 1/2 hour drive west of Ceiba. In Pico Bonito Natural Reserve, you can hike from near sea-level up to 8,000 feet in the Nombre de Dios mountain range. No place in Honduras offers a greater variety of Honduran life than Ceiba. • Relaxed taste of Caribbean life, Tela is the ticket. Tela has protected forests, national parks and botanical gardens all within 15 minutes. The tourism department of Tela has an informative website that will help you plan some time in the area. From Tela, day trips to the Garifuna (West African, Arawak and Carib indigenous ancestry) villages of Miami and Tornabe are superb “slow down, look, and listen” opportunities. • Hiking and birding in Honduras of a lifetime - virtually anywhere in Honduras. Over 30 cloud forests await you. Tropical preserves, mangrove swamps, lonely stretches of white sand, river rapids -- you name it, Honduras offers it. • Solitude and remote jungle areas, the Mosquitia offers unrivaled adventure and uniqueness. Not an area for the timid. Printing out a map will give you a better lay of the land. The map from Lonely Planet will probably cover all the cities and places you will be taking in. 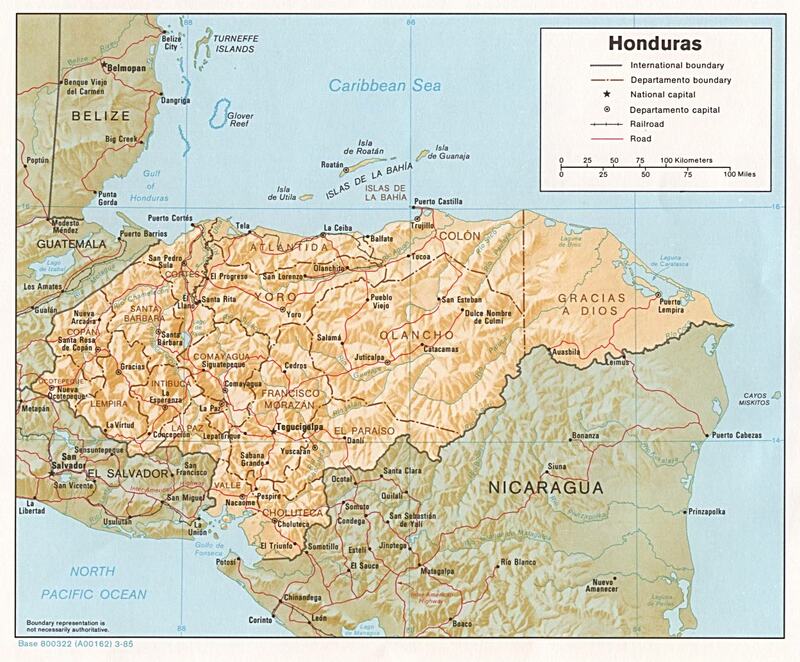 If you would like a map with more detail on Honduras geography, this map should help. I have collected an assortment of Honduras maps in their own section. Make it at least two weeks or more. You are committing the airfare. Two weeks provides you a more leisurely time and permits a refreshing of your spirit. You work very hard. Now, relax very hard. Unlike Mexico or Brazil, you won’t find a great variety of books out there on Honduras. Chris Humphrey's Moon Handbooks: Honduras is my favorite. Spend some time with it. Make your trip even more enjoyable by wading through some of the suggested reading in the excellent bibliography in the book. Taking some time to read about Honduras prior to the trip provides a richer context during your visit there. Chris's book is the one book to toss into your bag on the way to the airport. Adventures in Nature Honduras is another good book that would appeal to those seeking the 'green' approach to Honduras tourism, eco-tourism. It is harder to come by but can be ordered online. Tegucigalpa (Tegus) - Our journey didn't take us to Tegus. In another section of our website, Eric Timar gives the highlights of travel to Tegucigalpa, Honduras. Folks going to Tegucigalpa would be well served by getting their hands on Eric's Tegucigalpa Guide. Buy it for the dry humor even if you aren't going to Tegucigalpa. Eric writes a descriptive, readable guide that provides an excellent context for travel anywhere in Honduras. NOTE: While info on Tegus on the net is limited, Honduras Tips has the best overall site on Tegus. Make sure to use the nav buttons on the left (note: the home button takes you "off of" Tegus). Complete guidebooks to Central America are out there, with all the countries from Guatemala to Panama listed and described in great detail. By all means, browse through them at your favorite book store. But I would suggest not taking one along -- it’s too heavy to lug throughout Honduras. My wife even encouraged me to rip out just the parts from our Honduran book that we would need for our journey. While I think she is onto something, I couldn’t bring myself to doing it. I am afraid of going to librarians' he11. Next Section: Let's think through how much we want to plan and how much we should leave in the hands of a Honduran tour guide, all covered in the next section. Good Writer and Have Visited Honduras?